Don Quixote has been translated to over 140 languages, not bad! April, 24th commemorates the 400th anniversary of the death of its author, Miguel de Cervantes, born in 1547 in Alcalá de Henares, dying in 1616. A lot has changed since then. Have you thought about how would Don Quixote had been if social media had existed back in 1605? Although we cannot know whether Cervantes would have been a frequent Twitter user or not, some people still want him to be present on the online sphere. 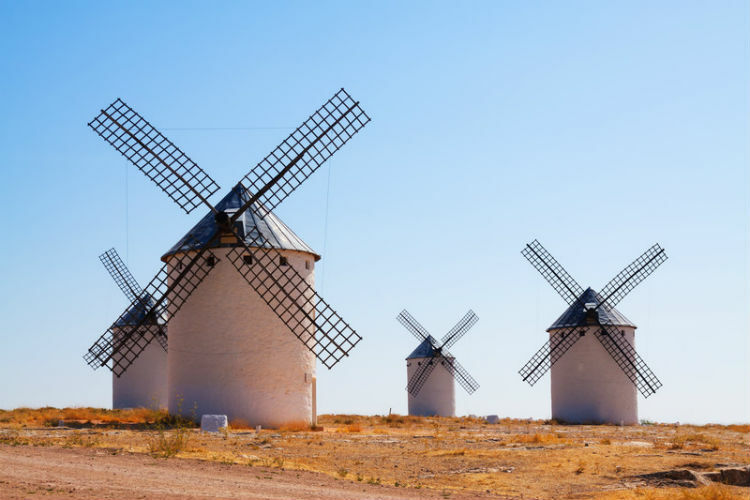 We have compiled a series of accounts you should follow to become an expert on Cervantes. Are you on Twitter all day but struggle to start reading a book? 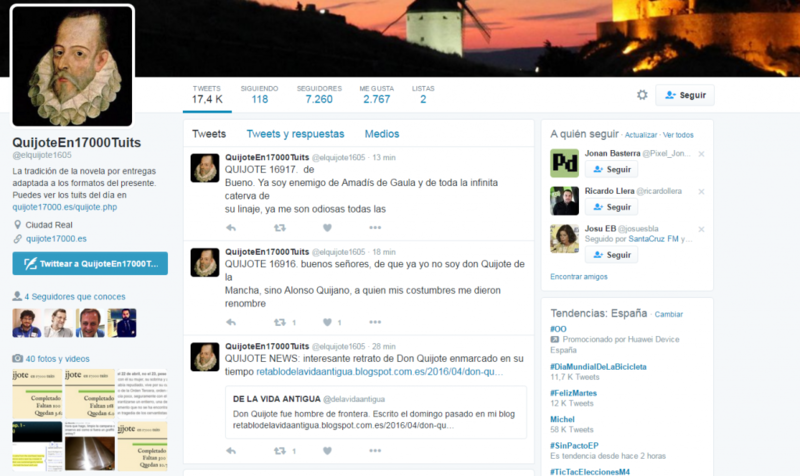 The account @elquijote1605 is the perfect solution for you (in Spanish). In over 17,000 tweets, the account tells the 1,000+ pages story in the novel. This project started on September, 1st 2014, and it publishes an average of 28 tweets per day. For those who followed the account from day 1, it is an original way to read one of the most celebrated works in Spanish literature. From the first tweet to the last, on April, 22nd, a lapse of two years and a half has passed. Do you like the idea? You are not the only one. The account has over 7,000 followers and enjoys a great engagement from the readers. The 400th anniversary of the death of Cervantes does not go unnoticed, that is for sure. 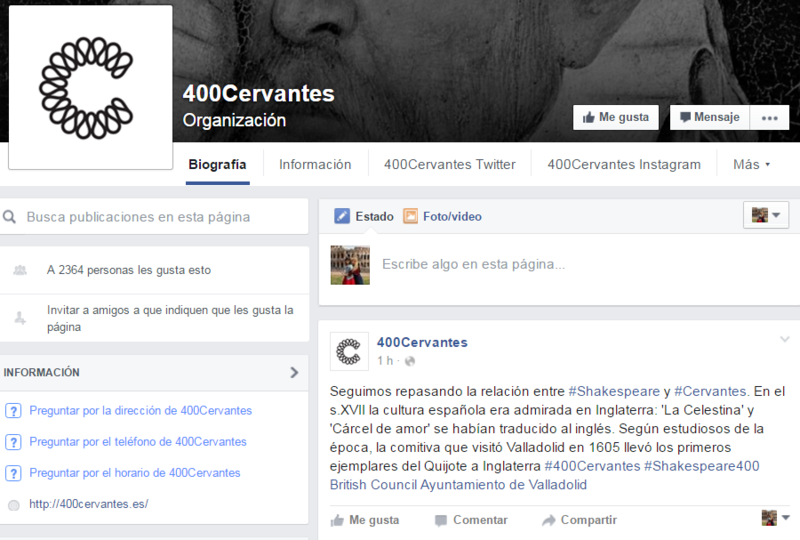 An example of this is the creation of the organization Cervantes 400, present on every social network. With the Twitter account @400Cervantes we can keep informed about news and events around the world that commemorate the writer. This account has also launched the campaign #aquímiquijote, which consists on people showing an owned copy of Don Quixote. The goal is to flood social networks with this work, and it is a campaign that is having great success among users. The organization has also a Facebook page with over 2,000 followers that show great interaction. If you follow this account you can keep up to date with the offline actions that take place in many cities around the world. @400Cervantes is on Instagram too. Here they show pictures with the events on schedule and they encourage people to participate with initiatives. The Instagram account @400cervantes has almost 300 users. In addition to all these initiatives to commemorate the death of the writer, Miguel de Cervantes has his own Facebook fan page with information in English and Spanish. They share news about events related to Don Quixote, fragments of the novel and opinions. The life of the author on social networks does not stop here. Both Twitter and Facebook have many accounts of people that post as if they were Miguel de Cervantes himself, commenting news or making jokes. Some of the accounts are no longer active. Not only on social networks…. Don Quixote goes digital. The National Library of Spain has an online portal, Quijotes, where they offer a compilation of different editions of this work in Spanish and other languages. There is also an interactive site of the novel that brings a new approach to this work including multimedia content that helps contextualize it. This is especially useful for children. Moreover, this fourth centenary will come with hundreds of offline actions such as theatre plays around the underground service of Madrid, dance, film series, publications and promotional activities, among others. Whether on networks, on the internet or paper, you have no excuse not to keep up to date with what is going on in a village of La Mancha.